Being one of the very unique features of our Organizational Health Check, Index is a set of indicators that precisely mirror the current overall organizational health. The total of eight indexes in three hierarchical levels that we created after in-depth empirical and theoretical studies are detailed in the diagram below. 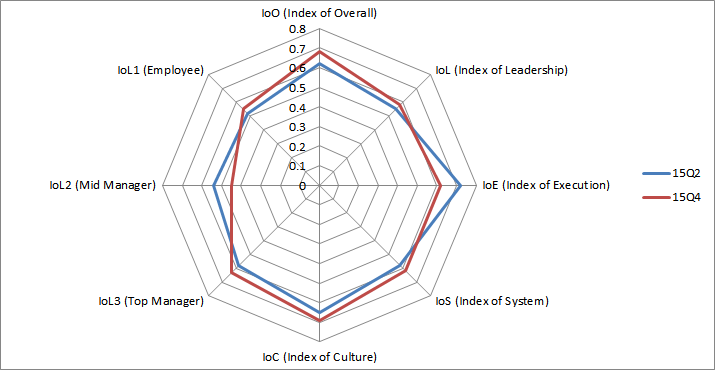 These metrics are calculated by weighting the aggregated data of each survey category (competencies of L1/L2/L3, leadership, corporate system, organizational culture) with the associated ratios derived from managers' index-related feedback in the same survey. For each survey conducted, a new set of indexes are generated from the survey results. Our Index is substantially representative because it is constructed on the basis of actual inputs from survey participants of clients' organizations, with their employee levels taken into account. 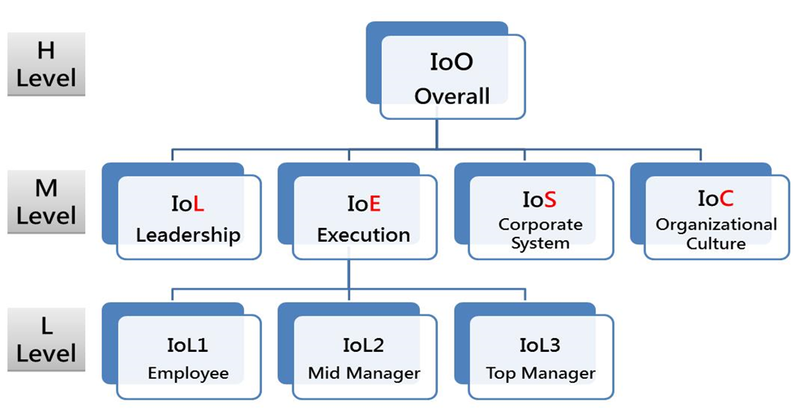 The Index can be applied to various companies across different industries, as the structure of eight indexes fully represents the hierarchy and the major components of an organization. These indicators are updated with every survey taken in the same organization. They serve as a set of highly useful tool that not only reflects the whole picture of the organizational status quo, but also the movements and the evolutions of the organizational health over the client-defined period of time. For example, there are two sets of indexes from the two Organizational Health Checks conducted in 2015.